Working with light and genetically engineered bacteria, researchers from Stanford University are able to shape the growth of bacterial communities. From polka dots to stripes to circuits, they can render intricate designs overnight. The technique, described in the Mar. 19 in Proceedings of the National Academy of Sciences, can achieve biofilms grown at a resolution of 25 micrometers, which is about one-quarter the size of a grain of table salt. "Most of the bacteria on Earth live in biofilm communities and biofilms are very relevant in disease in health – plaque on our teeth or catheter-based bacterial infection, for example," said Ingmar Riedel-Kruse, assistant professor of bioengineering and senior author of the paper. "Understanding how biofilms function is an important question on many levels." The group said the technique could clarify how biofilms grow and lead to the development of novel biomaterials or synthetic microbial communities that could be implemented in small devices or systems, such as microfluidic chips or biofilm-based circuits. The group's technique relies on E. coli bacteria they have genetically engineered to secrete a sticky protein in response to a particular wavelength of blue light. When they shine the appropriate wavelength light in the desired pattern on a culture dish of modified bacteria, the bacteria stick to the lit areas, forming a biofilm in the shape of the pattern. 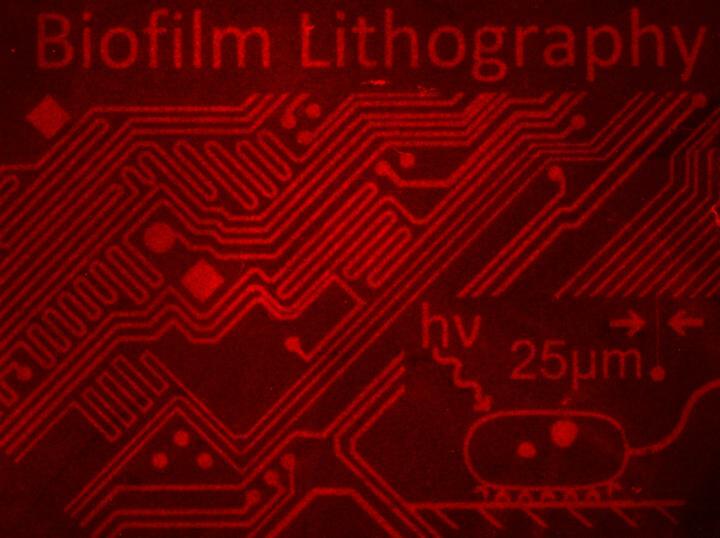 The researchers call their technique biofilm lithography for its similarity to lithography used in making electronic circuits. Other techniques for patterning bacterial communities exist, including depositing them with an inkjet printer or pre-patterning the culture surface with chemicals that bias bacterial growth in specific areas. However, biofilm lithography has the benefit of speed, simplicity, higher resolution and compatibility with a variety of surface environments including closed microfluidic devices, the researchers said. The intricate designs made possible with biofilm lithography could help in exploring the dynamics of bacterial communities. "Biofilms exist in a social environment with other bacteria," said Xiaofan Jin, a graduate student in bioengineering and lead author of the paper. "Interactions between these bacteria are often dictated by where they grow relative to each other and this could be a great tool for specifying exactly when and where in a bacterial community certain species can live." While testing biofilm lithography, the researchers already happened upon a new insight. They had assumed that cells swimming in and out of illuminated regions would result in blurry patterns, but the designs turned out surprisingly sharp. These crisp images led the group to conclude that many of the bacteria must already be weakly bound to the culture surface. Rather than cruising around the dish, it appears that bacteria are continuously jumping on and off the surface. "In the literature, there are different models of how certain bacterial species form biofilms," explained Riedel-Kruse. "We argue, at least with this species, that we provided additional evidence for that one hypothesis." By coincidence, the 25 micrometer resolution the researchers achieved with biofilms is similar to the first silicon photolithography, which contributed to the widespread success of silicon semiconductors. Similarly, the researchers see many versatile and impactful applications for their bacterial designs. "We're hoping this tool can be applied toward further understanding bacterial communities, both natural and synthetic," said Jin. "We also see potential in having these communities do useful things, such as metabolic biosynthesis or distributed biocomputation. It may even be possible to create novel biomaterials such as conductive biofilm circuits." The researchers are currently taking steps to grow multiple strains of bacteria simultaneously through biofilm lithography to make multi-species communities. In particular, they hope to understand how bacteria in a biofilm may share antibiotic resistance – a question with significant clinical implications, as biofilms are well-known for being stubborn against antibiotic treatment. Riedel-Kruse is also a member of Stanford Bio-X. This research was funded by Stanford Bio-X, the Natural Sciences and Engineering Research Council of Canada and the American Cancer Society.